You may have a notion of what an adhesive is, but here’s a helpful definition: an adhesive is simply a substance that bonds two substrates together. No matter where you are, you’re only an arm’s reach away from several adhesives at any given point in time. Historians have dated the use of adhesives back to over 6,000 years ago, to a time when prehistoric tribes used sap from trees to repair broken pottery. While not widely industrialized today, people once used collagen--a structural protein found in animal skin and connective tissue--to create adhesives. We still see products found in nature, such as natural rubber, used for adhesives. But over the last 100 years since the Industrial Revolution, chemists have developed many alternative technologies. One such technology, styrene-butadiene emulsion polymers, is a key building block used in formulating adhesives for a wide variety of applications. For more on the history of styrene-butadiene emulsion polymers, take a look at this article. 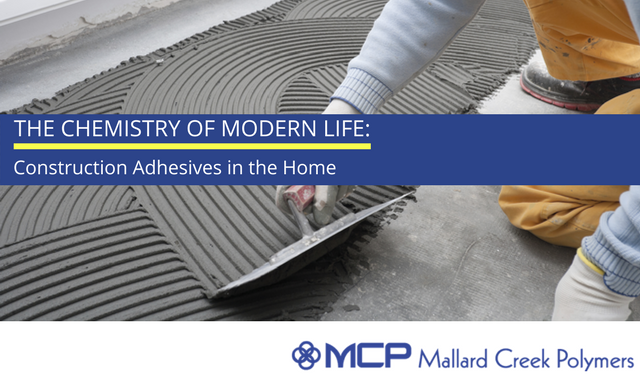 Let’s take a closer look at many of the ways adhesives keep our homes together. First, let’s consider the many types of construction adhesives used to build your home. Prior to laying floors, installers add a layer of adhesive to the sub-floor material to adhere to whatever type of flooring you see, whether it’s hardwoods in the living room, carpet in the bedrooms, or tile in the kitchen and bathrooms. In the context of flooring, adhesives serve a great purpose, to keep the flooring material in place, solid, and prevent shifting. You’ll also see very strong adhesives actually holding together layers of hardwood or laminate flooring itself, to create a seamless board. The beauty of adhesives is the wide flexibility of their use, in miniscule formats to large, heavy applications. Today, adhesives are even key elements of high-tech devices, capable of holding tiny electronic components in place in your smartphone. Wallpaper glue binds an often-delicate application of paper to hardier drywall, while cove base adhesives bring together heavier rubber and wall foundations like drywall and plaster. Adhesives also laminate thick pieces of wood together to form the table where you eat your meals. In the kitchen and shower, you’ll see adhesives forming a tight bond around a fixture. For example, you’ll see a plumbing adhesive used horizontally to prevent leaks between a faucet mount and a sink, while in the bathroom shower, you’ll see the same application in vertical fashion, adhering the faucet to the tile or fiberglass. In homes with older windows, we often see silicon-based caulk with a strong adhesive foundation, which helps the material form a seal that eliminates drafts from years of wear and expansion and contraction of the wood material of the window itself. Not all adhesives are permanent in use; many adhesives serve a temporary purpose, such as painter’s tape to give you the right edge to keep paint where you intend it to go. It’s important in these applications that masking tape do its job--without overdoing it by leaving sticky adhesives residue after the job is complete. At Mallard Creek Polymers, we produce a variety of emulsion polymers suitable for multiple adhesive applications. To learn more about our options for adhesives and more, contact us today.